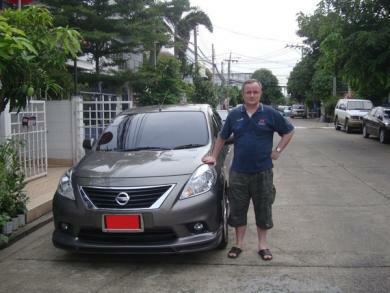 Today was a special day for my wife as we left the Bangkok Nissan dealer with her new Nissan Almera. Her old car, an Opel Corsa we bought second-hand two years ago was not in very good condition. We drove the car back home enjoying this special moment as it was the first new car purchase for both of us. My wife wanted a new car that is more spacious than the previous one, without being too big, and economical. After reviewing different brands, she decided to go for the Nissan Almera. 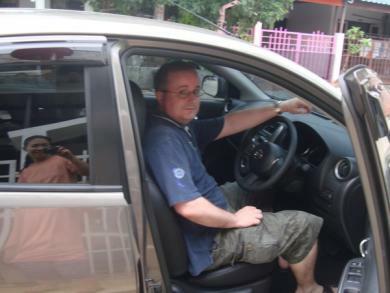 The car has a small engine, is very economical, but very spacious. 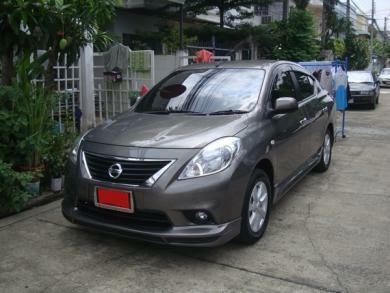 The price tag is also reasonable for a car like this with nearly all options: version VL CVT at 599,000 THB. I just drove the car for a few kilometers and I can say that it is very easy to drive. What is amazing is that you start the car pressing a button, and not with a key, and stop the car the same way. When you are still at the red light, the engine automatically stops, and when you press the gas pedal, the engine starts again. You also lock the car with a button located on the door handle or the remote control. The trunk is very spacious, and opens with the remote. If you leave the remote, which has also a key in it, inside the car, you can’t lock the doors. If you are in the car without the remote, you can’t start the car. 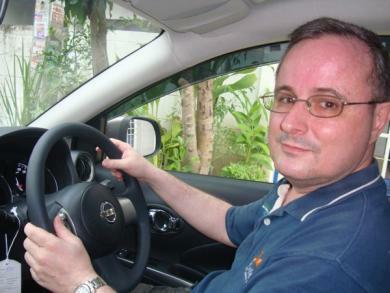 Michel Gerard standing in front of the new car – 31 August 13. You can see Naiyanan, my wife, taking the picture in the window reflection. In the driver’s seat: modern design and functions. 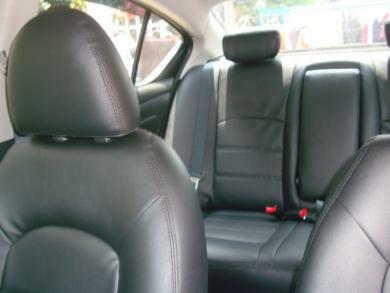 The Nissan Almera is very spacious and comfortable. Baby seat has been installed after taking this photo. 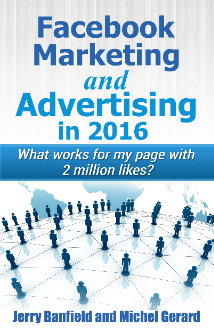 If you are considering to buy a Nissan Almera book your test drive with your Nissan dealer and see by yourself.